The final episode of Nate's story ended in March 2005. Please see the March 29th and April 5th 2005 reports on the Mississauga Clarkson page. His story has also been published in media other than our own website. See "Late great Nate recalled," an article published on April 21st, 2005 in The Mississauga News for more information. Nate was one of four young peregrines introduced to Richmond Hill in the summer of 1999 through the Canadian Peregrine Foundation's Project Release. He and his three brothers were released from the hack box on June 28, and gradually began to acquire the skills required for independence over the course of July and August. 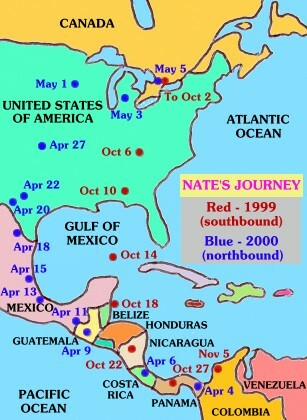 In early October, Nate began his southward journey. Within just over one month, he flew nearly 5000 km to reach the coast of Colombia, where he spent the winter. During the first week of April, Nate finally began to move again - and within a month was back home in Ontario.